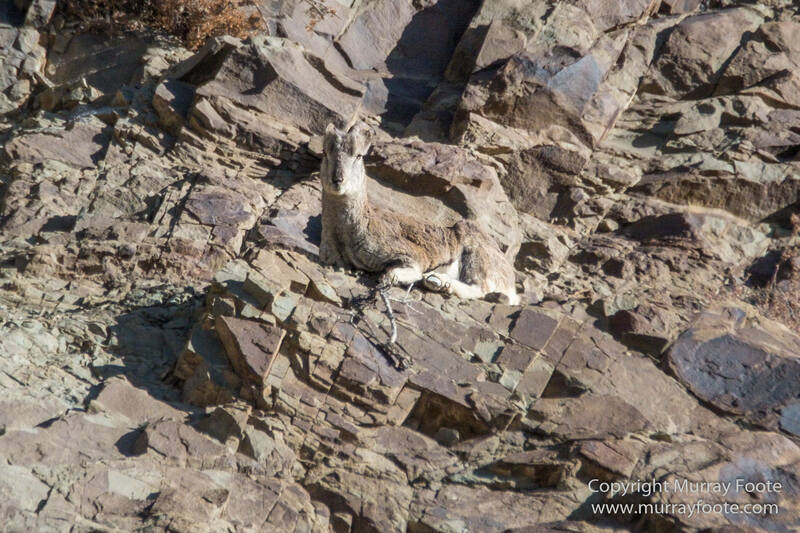 Far up on a mountainside we spotted some blue sheep, also known as bharal. Not to be confused with the red sheep of Voltaire’s Candide. This is the female. And this is the male. 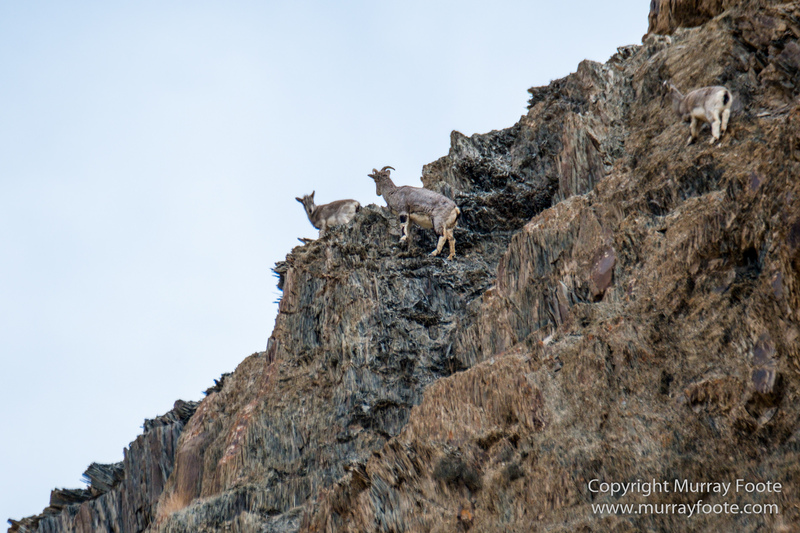 Blue sheep are the main food source of snow leopards so this was an indication there may be snow leopards around. An hour later, we are in a side valley and you can see a bit of the floor of the main valley in the distance. I think the blue sheep were on the other side of the main valley. 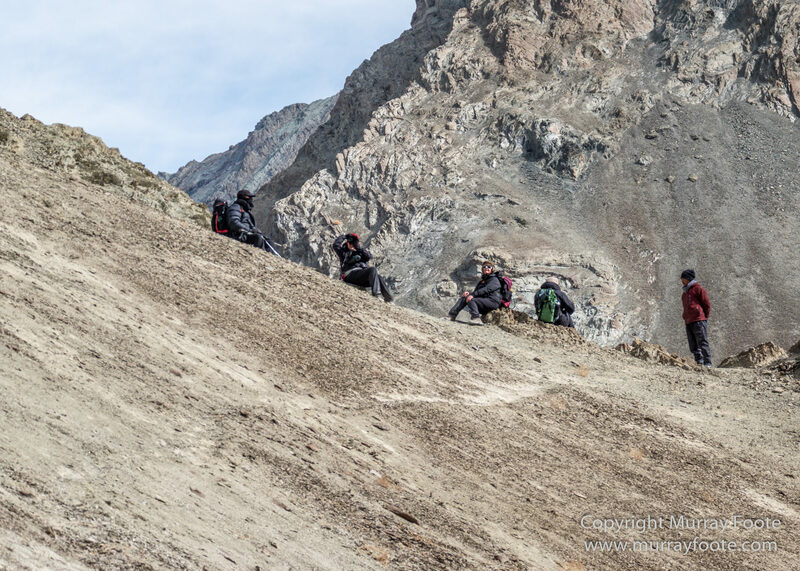 We are 3,500 to 4,000 metres high. Walking uphill is very slow in these conditions. If you try to go at all quickly you soon have to stop and recover. It is better to walk very slowly and keep going. 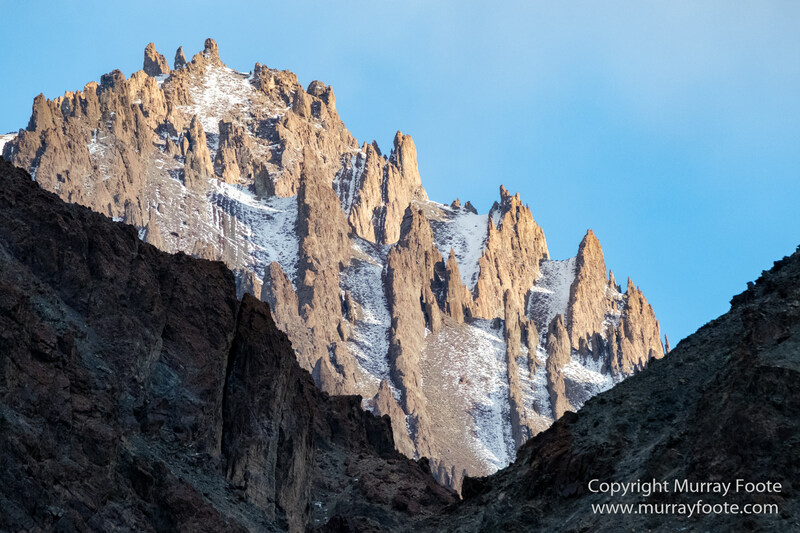 You can also see the track across the scree slope to the ridge here on the far left of the previous image. 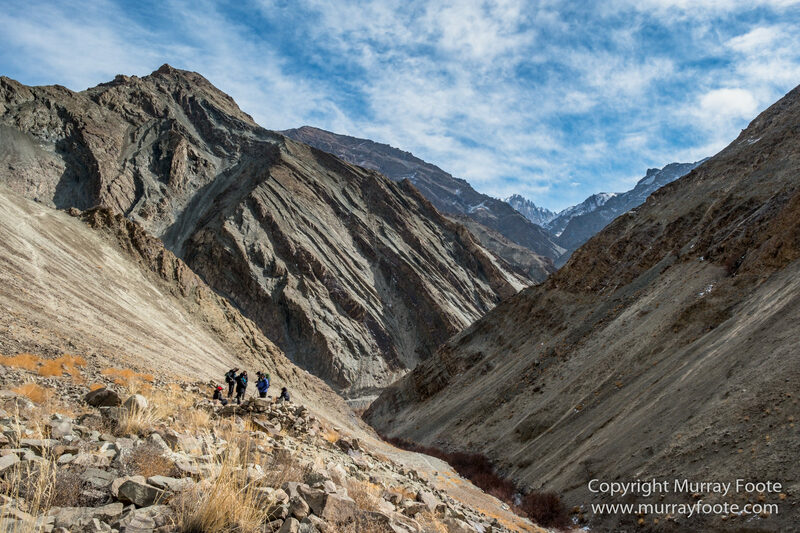 A bit later, when a few more people were there, Jools and I set off across the scree slope to join them. Half way across they waved us back. There was just a narrow ledge and no room for any more. 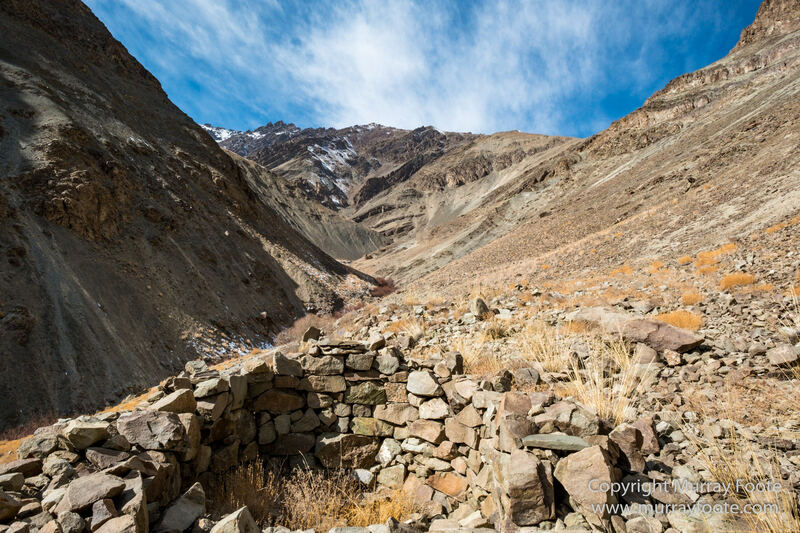 Back at the resting point, there was the remains of an old structure, too small for a house. I decided it looked easier to get down to the valley by going on further rather than going back the way we came. I didn’t find anything of particular interest further on in that valley though. 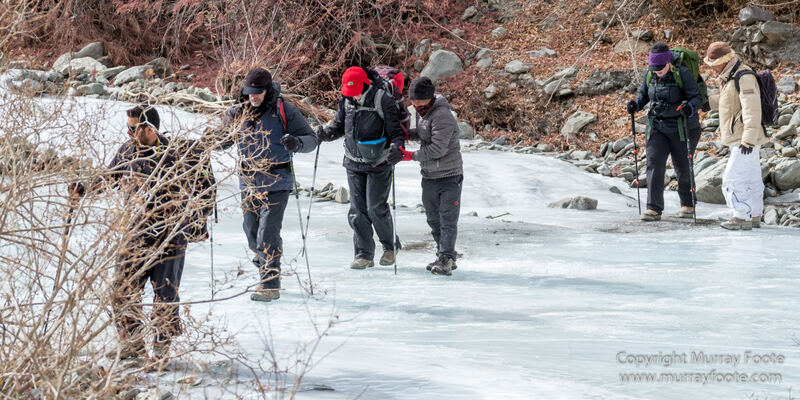 Crossing the ice in the frozen river of the main valley is a delicate task, especially the first couple of times. 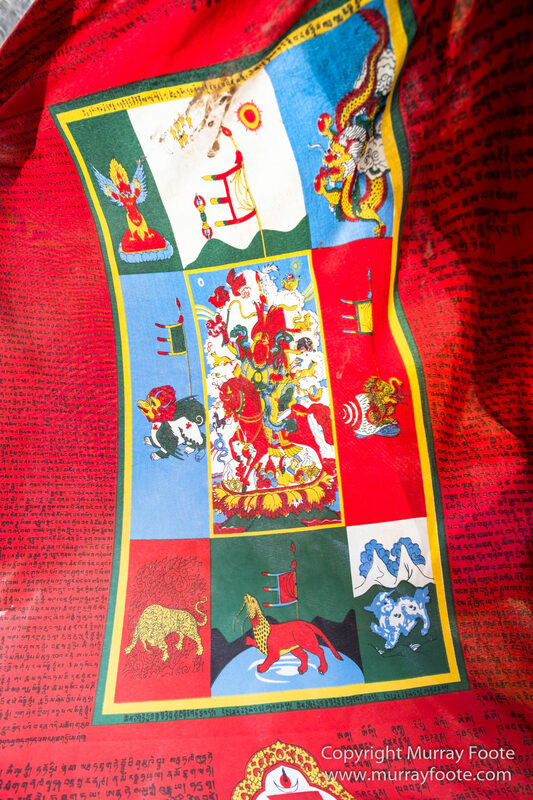 Remarkable details of a flag on a stupa. More blue sheep, from a valley on the other side of the main valley. Their coats look a bit more blue here so you can see how they get their name. I had a few equipment problems. In particular, my long zoom lens fell three feet to the ground off my monopod at one point. It seemed to be working but images from the longer end of the zoom range are not sharp (including the shots of the blue sheep in this post). It is now in for repair. I also had problems with both cameras (Fuji X-T2s) due to the cold weather. One showed some strange looking images in the viewfinder (eg monochrome plus blue) but this did not affect the RAW files so the camera was still usable and it returned to normal when I reset it when I got home. The other one got stuck on particular shutter speeds from 1/320 to 1/800 sec which was a bit more inconvenient. Fuji fixed that under warranty when I got home. I was not the only one with equipment problems in the extreme conditions. One photographer’s Nikon D850 stopped working entirely. Distant mountains in the late afternoon light. 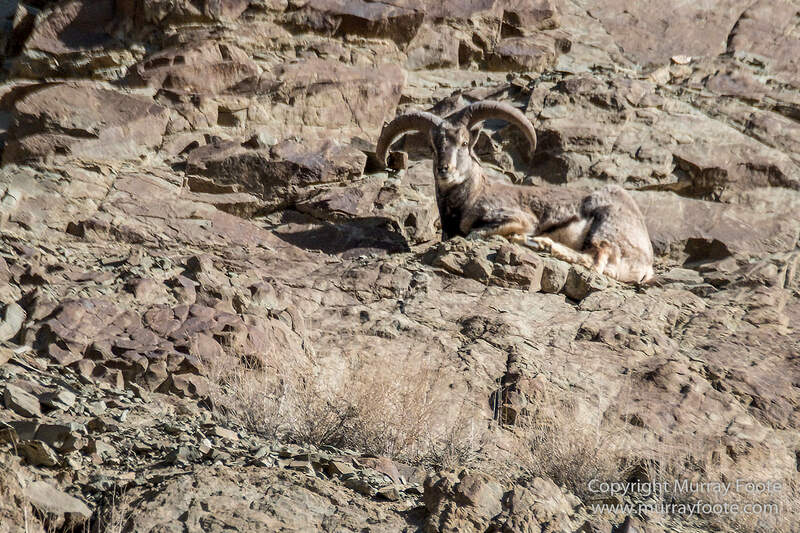 This entry was posted in Australia and tagged Bharal, Blue Sheep, Hemis National Park, India, Ladakh, Landscape, Nature, Photography, Rumbak, Tibet, Travel, Wilderness. Sometime, Id like to hear the details of your travels. How you got there, who’s behind them, Who decides them? Etc. 🙂 You certainly have a remarkable advantage, and then your age is that too. I do all the planning and book everything in advance, except as in this case where I join a tour. Great pics. Hope the long lens recovers. Thank you. I’m sure it’ll be fine. They are waiting on parts at the moment.